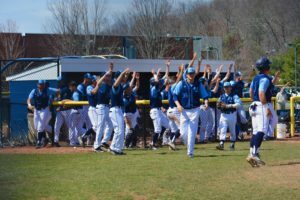 After falling to Canisius twice on Saturday, the Quinnipiac men’s baseball team ended the weekend in style with a come-from-behind walkoff win against the Golden Griffs on Sunday at the QU Baseball Field. 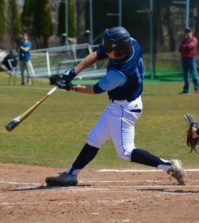 Sophomore catcher Colton Bender laced a ground ball down the third-base line and a misplay by Canisius senior outfielder Mark McKenna in left field allowed senior infielder Kevin Huscher to score from first base and send the Bobcats home with a 10-9 win. Neither starter really had their stuff today, as Quinnipiac sophomore pitcher Arthur Correira and Canisius junior pitcher Andrew Kneussle each could not reach five innings. Quinnipiac jumped on Kneussle for two runs in the second, but Canisius then answered the next inning with redshirt junior William Krull hitting a three-run homer. In the bottom of the third, sophomore infielder Ian Ostberg ripped a double into centerfield with the bases loaded that brought all three runners home and temporarily gave the Bobcats a 5-3 lead. Canisius got the long ball working again when in the fifth, junior outfielder Jacob Victor sent a three-run shot over the left field fence that allowed Canisius to regain the lead. A couple batters later, senior infielder Conner Morro joined the launch party, ending Correira’s day with a solo home run that made the game 7-5. Each team exchanged runs and it was a 9-7 game in favor of the Golden Griffs heading into the bottom of the ninth. After getting 3.2 solid innings of relief from junior Jarod Burmaster, Canisius brought in junior Will Frank to close the deal. The Bobcats had other thoughts. The first batter he faced was junior infielder Evan Vulgamore, who welcomed Frank by sending a solo shot over the fence in left-center field to make it a one-run game. That was followed by a single by junior outfielder Andre Marrero to put the tying run on base. After a few batters, the game was down to two outs, with junior Derek Kasperzyk on third, who pinch ran for Marrero, and Ostberg on first. Junior infielder Dylan Lutz grounded a ball to Canisius third baseman, junior Stephen Bennett, who bobbled the ball and was unable to throw Lutz out. Kasperzyk raced home to tie the game at 9. With the game in extra innings, it only took two batters to capitalize, as after a leadoff walk to Huscher, Bender ended the game with his RBI double in the 10th, sending the Bobcats into a victorious frenzy. Quinnipiac received exceptional relief pitching from junior Colin Donnelly (3.0 IP, 2 Hs, 2 Rs) and senior Andrew Workman (2.1 IP, 2 Hs, 0 Rs), who picked up his second win on the season. Quinnipiac is now tied with Canisius for first place in the MAAC with matching 7-2 conference records and Marrero stretched his hitting streak to 15 games. “Today we had a strong focus, we discussed it before the game, of taking that mentality in the eighth or ninth inning and stretch it all nine innings,” Delaney said. “That’s why we were able to be down in the game, found a way to chip ahead, go down, chip back and there’s a resiliency that’s kind of untapped with these guys. 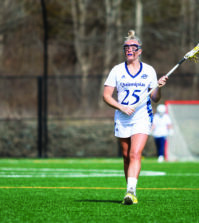 Quinnipiac’s next game will be on Tuesday, April 9 as it takes on Hartford in an out-of-conference matchup in Hartford at 3 p.m.